Painting your home is an effective and relatively inexpive way to enhance its apearance and keep it in great condition. At Permier Painting, our professional Peabody painting contractors strive to provide our clients with the highest quality paiting services possible at every job that we perform. Whether you're painting your home's interior or exterior, need wallpaper removed or installed, or you're looking for handyman services, you can rely on our experts for quality workmanship and professional cutstomer service. 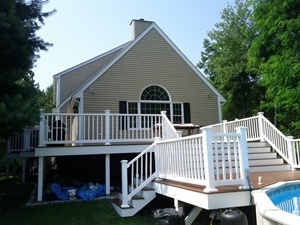 Our painters in Peabody, MA are all professionally trained and experienced, so we're able to handle absolutely any painting job that you need performed on your home. We understand that your home plays an important role in the everyday lives of you and your family, so we don't take any of our work lightly. We offer a 100% satisfaction guarantee with all of the work we performed, and we'll make sure that you get everything you need from the services that we provide. Call us today to schedule your consultation with one of our painting contractors, or to ask any questions you have about the services that we provide, and we'll be looking forward to working with you. Any homeowner works hard to keep their home in excellent condition, so when you're having your home painted, you need to know you're getting high quality service that you can rely on. Our Peabody painting contractors work hard to provide you with painting services that will keep your home in great condition. We'll work with you directly to select the perfect colors, textures, paints, and finishes for your home. Painting your home's interior is a perfect way to make it feel more comfortable and enhance its design. Painting its exterior will help to protect it from weather and the elements while also enhancing its curb appeal. Our experts will use only the highest quality painting materials on the market to provide you with the bet painting services possible. With such a wealth of design options available, wallpaper can be perfect for any home's interior design, and our Peabody painting contractors can work with you to choose the perfect wallpaper for any part of your home. Our wallpaper installations in Peabody are high quality, and we'll guarantee your satisfaction with the work. If you need to replace your wallpaper, or if you'd like to paint any walls that are currently wallpapered, we also offer thorough wallpaper removal services that will leave your home's walls in great shape. "Excellent workmanship. Sticks to appointments, and has great pricing. Would recommend highly." "Bill has done various interior painting and wallpapering in my home. Bill has also done an excellent job painting my exterior decks. His work is superb, neat and always finished in a timely manner. I would highly recommend him as I already have and will continue to do so. Nice to be able to call someone so reliable. Thank You Bill!" "Bill painted my entire condo unit – all rooms! He was very professional and completed the entire project in a very timely fashion. I am so pleased with the results and would recommend Premier Painting to anyone looking for reliable, high-quality painting!" If you are looking for a reliable Peabody painting contractor, please call Premier Painting at 978-532-7788 or complete our online request form.